It’s time to thank the fun folks at Fowl Play for their cool chook toys, treats and new blog. Don’t forget to visit their online homestead and see what’s cluckin’ over there. 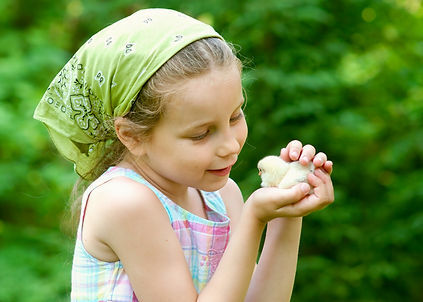 Here is a post on kids raising chickens! “What in the heck is a Chicken Swing?” Pierre and Delphine’s chicks love their . Find out what these two French birds are cluckin’ about. C’est Marveilleux. Hmmm, that isn’t just a coincidence! Behavioral science has proved that raising children with companion animals fosters empathy, critical thinking and a lifelong ability to act with compassion and thoughtfulness. Animals also instill a strong sense of self-esteem. Kids with critters are happy kids. And….critters help to form and strengthen a child’s immune system. 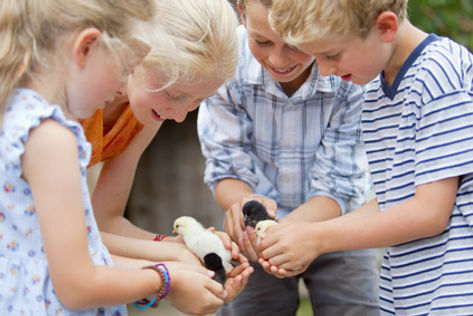 We want our kids to have an enriched experience with these feathered friends. The bond between a chicken and his or her child is nothing short of magical. For those of us who grew up with those chicken friends (and were the “cool” kid BECAUSE we had chickens! ), recollections of warm sunny days hanging with some real “peeps” reminds us of why we want our kids to have that same experience. If we sit back and watch, the interaction between children and chickens will happen as naturally as a bee finds his flowers! It really is that easy. Here are a few tips to ensure that some wonderful memories will be crafted in your backyard. • Get the children involved in coop planning. Have them be active members in the designing of your chickens’ barn. Let them decorate the structure with their own “themes,” and come up with a name for their chicken chateau. • Work though flock safety issues with your entire family. What materials will you use to fence in the birds? What are the best predator-proofing ideas? Design the run areas (you will want to “rest” one run, so consider space for two runs) and choose the enrichment furniture and plants that you will be adding to the outside area. Where will you hang The Chicken Swing and what type of plants will you want to add? Chickens need brush and trees for shade and to feel secure. Add fast growing forsythia and thick stands of raspberry bushes. Gooseberry plants are also good at predator protection (they have spines). Grapevines are perfect cover plants, and you get grapes. Children love planning and planting their chicken garden! • Chickens have individual personalities. There isn’t one breed of bird that will or will not suit your family. Birds are unique – and that’s why we love them. • Chickens are clean birds (they are birds, not mammals, which significantly reduces any zoonotic disease issues). A properly cleaned and maintained poultry yard is a delight! Happy, healthy and perky chickens are wonderful family members. You can also compost the manure for the garden. Evidence and research from the CDC establishes that chickens are a very low disease risk for any individuals who are not immunocompromised. There were 1.2 million human food-borne derived salmonella cases in 2010. There were less than 98 live chicken related cases. You are far more likely to get sick from handling your cell phone or getting take-out, than caring for a backyard flock! This post was shared on The Homesteader Hop.